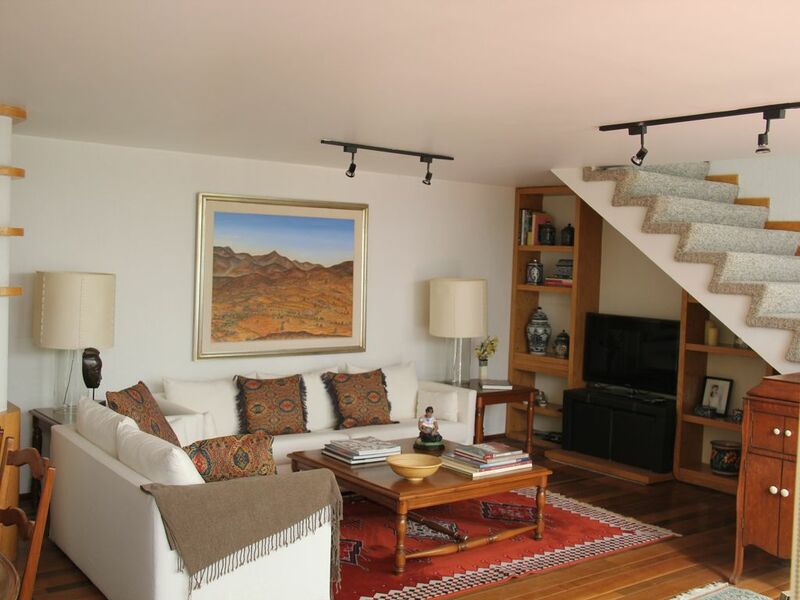 Tastefully equipped duplex with Mexican art and high end furniture in one of Mexico city's most beautiful areas. Extremely well served by public transportation and taxi stands, Metro nearby. Walking distance to all the restaurants, cafes, galleries, boutiques, bookstores and theaters of Coyoacan historical center, to its market, to Frida Kahlo´s and Trotsky´s houses that are now museums, H. Cortes' palace, etc. There are several delis, wine shops, a very large supermarket, and a green market in the neighborhood. Parks, lovely plazas and Coyoacan's famous 'Viveros', a 39 hectares park where it is possible to exercise and jog every morning on its 2 mile running track. The duplex has a fully equipped *recently renovated* kitchen, microwave, coffee maker, dish washer, oven, stove, 2 bedrooms (king and twins), 2 Plasma TV's, WiFi; bathroom, independent patio, outdoor grill, laundry room with washer and dryer. Also, a baby crib is available upon request. Coyoacan is a very quiet and charming district of Mexico City, with lots of trees, colonial houses and pretty alleys; a very pleasant place to walk and enjoy Mexico's great climate. No wonder it is where conquistador Hernan Cortes established his first residence. I was born and raised here in Mexico City and I have lived in Coyoacán my whole life. Right now, i'm an Art History student at a university in the city. I am completely fluent in English and Spanish but I also speak French quite well. My parents inherited the property from my grandfather. They began their married life and started a family here. I am very fond of it. It is a specially quiet and well located property in one of the nicest areas of Coyoacan, where Mexican golden era movie stars used to live. Actually, the name of the street is Dulce (sweet) Olivia, in honor of Olivia de Havilland. Nice, clean and has a big shower. (no bathtub). The towels are new and have a very good quality. It has been recently renovated. Elegant apartment in a quaint charming area. Very quiet and safe. Friendly and very responsive host. Coyoacan is a historic village-within-a-city. It is not convenient in terms of the heart of the city: depending on traffic, it is 30-50 minutes by uber; and a 10-minute walk to the metro, which then takes another 30 minutes. But it is full of colonial charm; has a fun Zocola (plaza) to stroll in both by day and night; and includes Casa Azul (Frida Kahla's family home), a lovely park, and some pleasant restaurants. It is also quite "real" in the sense that it is touristed by not touristy. And this apartment is the perfect place to enjoy the neighborhood. It is located on a side street, half-way between the metro and the Zocola. One block away is our favorite place for breakfast, lunch or dinner, facing a small plaza. Several blocks away is a great supermarket. And more. It is also perfect in and of itself. You walk through a small courtyard to get to the front door: it is totally private and quiet. The photographs are completely accurate: it is beautifully furnished and comfortable, with a variety of spaces. We felt like we were at home the moment we entered. We like to travel staying awhile in a single place to get more of a feel for what neighborhood-living is like in the cities we go to. We both have work that we bring with us, so we also like a place we can hunker down. And we invite our kids and friends to visit, so two bedrooms is always better than one. This fit the bill perfectly. We are already planning to return. A great place in a lovely neighborhood! Sofia’s apartment and the neighborhood are delightful, safe and quiet. My husband and I are in our 60’s and the apartment was a sanctuary from our days of sightseeing. The windows face the courtyard and there is a little terrace on the top floor (narrow twisty stairway) where I often had coffee and enjoyed the sun - this being December. The apartment has everything one could need and the the beds are comfortable. The home was very clean, and Sofia was extraordinarily prompt in answering my few questions. Nice art and books about Mexico complemented this interestingly designed apartment. Mucho Gracias! Our third time and we love it!! I traveled with my wife and two kids visiting family. We are originally from Mexico City and live in the US now. We come back twice a year and we found this perfect house!! This is our third time staying here. The location is safe, quiet, walking distance to many attractions, services and shopping centers. The house is always clean, functional and plenty of room for my family. Sofia, the owner, is always available for any questions. I highly recommend this house for any type of trip, either business, pleasure or visiting relatives. We’ll come back soon for sure! Lovely, quiet apartment in great area. Lovely apartment, very quiet area of Coyoacan, easy and safe walk to Plaza, Frida's house (make sure you book online or you will be waiting for hours) restaurants, markets, huge park, supermarkets, banks etc. The apartment is spacious and very comfortable - it has a lovely feel to it, aided by the art, books and furnishings. Kitchen has plenty of equipment and is clean. Beds are comfortable and rooms can be made dark. Really helpful hosts who went out of their way to make our stay enjoyable but also allowed us plenty of privacy. I would highly recommend. We, a family of three, enjoyed a quiet week of visiting museums, reading in local parks, and exploring Santa Catarina and it’s neighboring barrios. The apartment afforded a gentle retreat from the hustle and bustle of CDMX. Sofia, Calicha, Aurora and Raul were available to assist with every need and answer all of our questions. We plan to return as soon as the vagaries of coordinating vacation schedules and budgeting concerns can be resolved. Originally separate colonial towns and then suburbs of Mexico City, San Angel and Coyoacán were both absorbed by the ever-growing capital. But they've managed to retain their original tranquility. You'll want to linger in these elegant sections of town, especially in Coyoacán. The Frida Kahlo and Leon Trotsky museums give intense, intimate looks at the lives of two famous people who were friends and lovers, and who breathed their personalities into the places where they lived. Remember that museums close on Monday. You must pay the first 50% in VRBO BOOKING NOW, the second pay and deposit please in chash American Dollar when you arrive at property.